On behalf of all of us at Return to Freedom, we thank Larry Edwards for the nomination, for the Montecito Bank and Trust Anniversary Awards. Special thanks to Wendie Malick for making the PSA! This Article was Published 3/22/16, Noozhawk, By Jamie Perez for Montecito Bank & Trust. 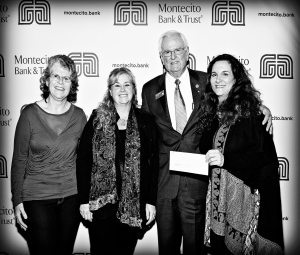 Montecito Bank & Trust celebrated its 41st anniversary in familiar fashion Thursday, March 17, awarding Anniversary Grants to 10 local nonprofit organizations. Each year for the past 24 years, the bank has celebrated by giving its associates the opportunity to nominate and vote for the organizations that receive the special Anniversary Grants award and $2,000 towards continuing their missions. Janet A. Garufis, president and CEO said, “Anniversary Grants is one of my favorite MB&T events. Since our beginning on March 17, 1975, giving back to our community has been one of our most important corporate values. What better way to celebrate MB&T’s 41 years of success in serving the banking needs of our communities than by inviting our associates to nominate and select the community organizations that will be recognized. Montecito Bank & Trust congratulates the Anniversary Grants Class of 2016: Angels Foster Care of Santa Barbara, Atterdag Village of Solvang Auxiliary, C.A.R.E4Paws, Child Abuse Listening Mediation, Dons Net Café, Easy Lift Transportation, Inc., Juvenile Diabetes Research Foundation (JDRF) – Central Coast Council, Old Yeller Ranch Rescue, Return to Freedom and Santa Barbara Choral Society. The bank would also like to offer a special thanks to its corporate partner, Cox Communications, for generously producing a short promotional video which showcases each of the recipients’ extraordinary work. In addition to the funding, Anniversary Grants recipients appreciate these Cox videos as an invaluable resource to continue their fundraising efforts. ​— Jamie Perez is the community outreach and events manager at Montecito Bank & Trust.